12 MONTHS OF FULL GOLF MEMBERSHIP FOR THE PRICE OF 11 AND HALF OFF CART FEES! 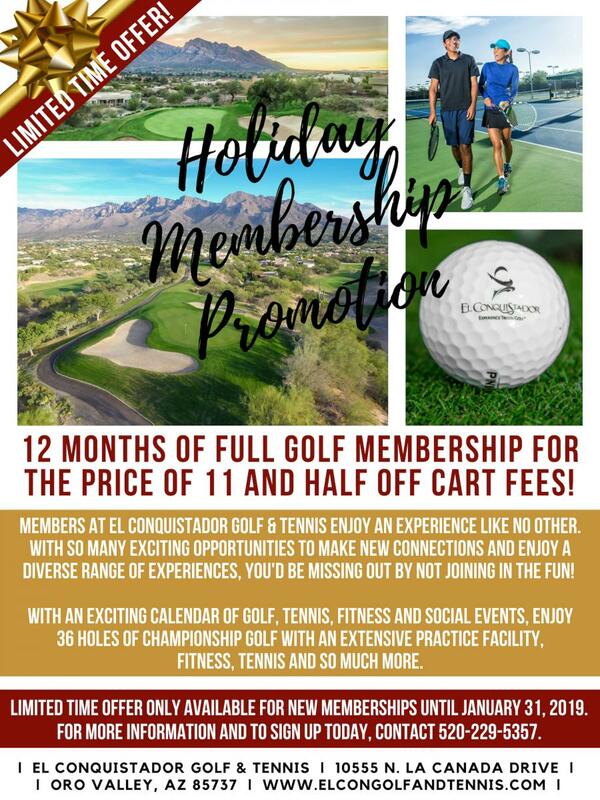 Members at El Conquistador Golf & Tennis enjoy an experience like no other. With so many exciting opportunities to make new connections and enjoy a diverse range of experiences, you'd be missing out by not joining in the fun! With an exciting calendar of golf, tennis, fitness and social events, enjoy 36 holes of championship golf with an extensive practice facility, fitness, tennis and so much more. Sign up for a full golf membership with this great promotion and receive one month free of dues AND cart fees, plus 50% off cart fees for the whole year! Limited time offer only available for new memberships until January 31, 2019.